Seriously. 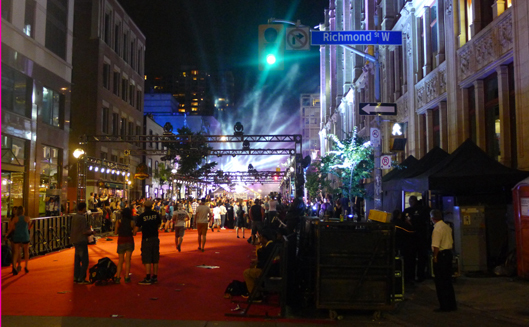 It’s not so much that I don’t like the MMVAs (MuchMusic Video Awards), which transformed downtown Toronto last weekend. It’s more that I don’t like the chaos and mess that goes with it (read: detours to my bike route). 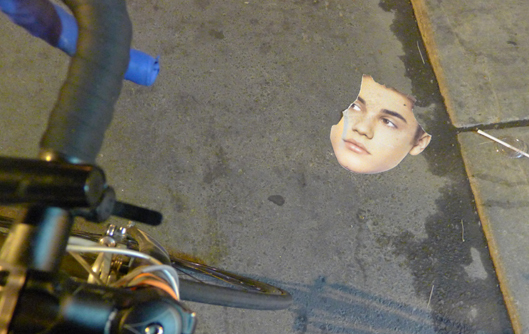 Witness the remnants of this giant paper Bieber head, held up high by hoards of squealing teenage girls all night long, discarded on the side of the road near show’s end. No, I really do love the MMVAs, a huge, loud, fun, free street party open to everyone. And I do mean everyone – wristbands get you prime positions, but anyone can catch the action live from the street or the red carpet. 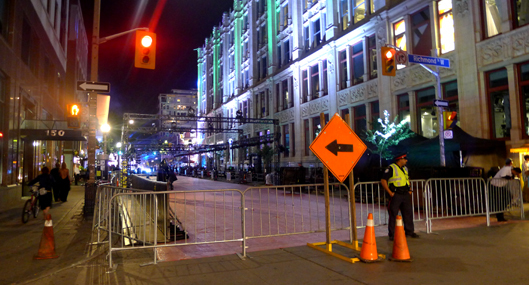 The MMVAs aren’t a traditional awards show in that it doesn’t take place in a theatre: multiple massive stages are strategically placed along several city streets (and a parking lot) surrounding the music video channel’s headquarters at the corner of Queen and John. This is how John Street (a.k.a. the red carpet) looked post-MMVAs. The sidewalks were still so packed, it was impossible to push through the crowds. Those few blocks are blocked off from traffic (some of them are closed almost a week before the event!) and are packed with massive crowds, the likes of which started lining up the morning of – armed with their coveted wristbands – several hours before the celebrated show started. The very same fans camped out for days the week before, keen to score their MMVA wristbands when MuchMusic handed them out on June 8. Now, that’s dedication! Truly, the MMVAs is a show for the fans. As the performers and presenters walk the red carpet, they sign autographs, pose for pics and get interviewed by MuchMusic VJs. But before the celebs get to that point, they’ve already got fans screaming (and I do mean SCREAMING) over their outrageous entrances: this year, breakout former Canadian Idol contestant Carly Rae Jepsen, clad in an Angelina-worthy double thigh-high-slit leather dress, pulled up in a convertible being washed by shirtless hotties. Such street-party spectacle brings massive energy to Queen West, and the hoards will hang out for hours, even if they can’t see a stage. For many, it’s enough to hear the hubbub and be a part of the electric enviro. And when you can feel like you’re thisclose to chart toppers Katy Perry (this year’s cohost), Justin Bieber, LMFAO and Kelly Clarkson, why wouldn’t you brave being crushed in a crowd of screaming fans? A couple of nights before the big show, John Street was already decked out with scaffolding and police were standing guard to direct traffic. 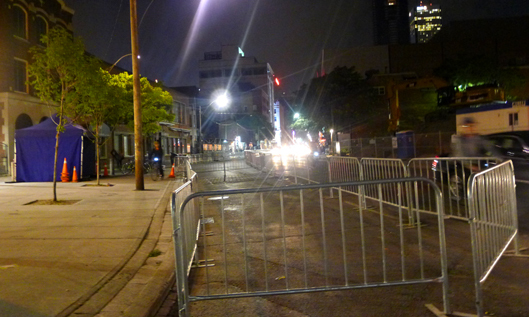 Half of Richmond was sectioned off by barricades to funnel the wristband crowd, and it was still blocked off when I biked by near show’s end.